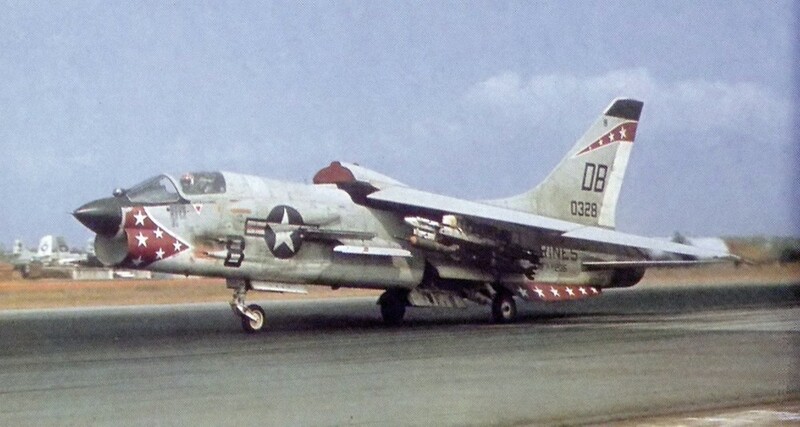 Fixed Wing Marine Fighter (All Weather) Squadron VMF(AW)-235 deployed to Vietnam on February 1, 1966 flying the F-8E Crusader. Between February 2 and November 15, 1966 the “Death Angels” flew over 6,000 combat sorties in support of over 22 major operations. They returned to Vietnam on February 15, 1967 this time for over a year until May 11, 1968. They were the last active duty Crusader squadron. Upon leaving Vietnam, the squadron moved to Marine Corps Air Station Kaneohe Bay. On September 6, 1968 they were redesignated Fixed Wing Marine Fighter Attack Squadron VMFA-235 and equipped with the F-4 Phantom. This aircraft, F-8E BuNo 149201, was flown by Lt Chris de Laurier from Da Nang in 1968.